Wow! I can't believe I'm starting this review and recap right now. 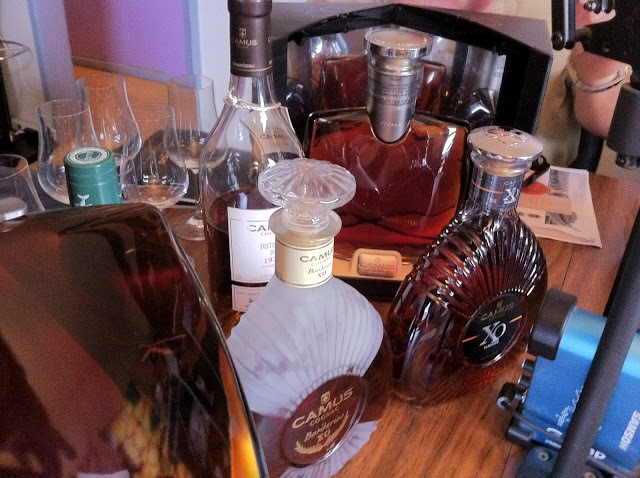 It's 10 pm and I just got home a little while ago from the most awesome Cognac tasting ever. Yep, I was a guest on ByTheGlassShow.com (you can watch and/or listen there), and tonight Florida State Sales Manager Alexandra Albu brought the show to a standing ovation for Camus Cognacs. Alex was perfectly on time, and I only say that to remind you people in Miami what an attribute that actually is. Plus Jorge starts the show at 6, guest or not. And let me tell you about the ferocious rain that Alex and Jorge and Brett fought to get a bunch of samples and gear into the studio. The moat was no match for heels and spirit! Alex let us know that we were lucky to find her, since her top 5 Cognac-producing, family-owned company chooses to remain completely traditional, passing on Twitter and Facebook (solid move considering all the assholes on both). Fortunately for you, Good Samaritans like myself exist to let you know more about these products. Actually, the Camus reputation for making awesome Cognacs precedes my existence. If you don't believe me, we had a Vintage Camus Cognac from 1971, the year of my (and Brett's) birth. Anyway, we only did one commercial break. The interview Brett and Alex did was terrific, very fluid, complete on dozens of topics, and didn't necessarily interrupt the drinking of Camus Cognacs. Well, it did, a little, but "Ivan Bad" spoke up when he needed his glass filled. And I seconded his emotion. Cognac is highly regulated in France to ensure its quality, with dozens of rules that must be followed. The Cellar Master from Camus, however, thinks beyond those regulations and focuses on delivering products that exceed any minimums. The cellar master knows what is in every barrel and is so awesome he anticipates what will become of every barrel ten years in advance. So we took the Cellarmaster Challenge, starting with XO offerings and progressing up the most awesome ladder ever. Camus became well-known through strategic arrangements with DutyFree, but it's now available everywhere, so time to check it out. We also learned that China is a top consumer of Camus, but I'm betting that the American Spirit can reverse that established trend. Come on, you guys! Brett interviewed Alex. We chimed in with some funnies, and eventually we got our first Camus Cognac about 15 minutes into the show. Whew! 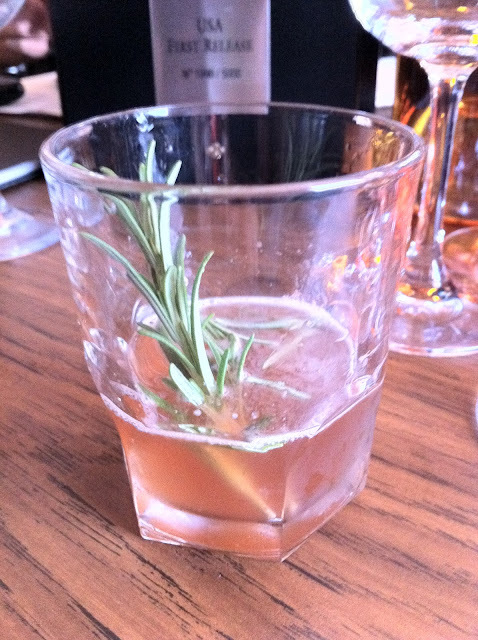 Riveting knowledge but an empty glass... We started with XO Elegance, a blend from the top four regions of Cognac. XO as a designation requires a minimum years the Cognac must be aged, six I think Alex said, but Camus ages their Elegance for an average of 25 years. What an aroma! Beautiful fruit and toffee. The flavors are outstanding, too. More toffee with some almonds and a basket of fruit. Apples, apricots and oranges. Little hints of vanilla and wood rounded out one terrific beginning. 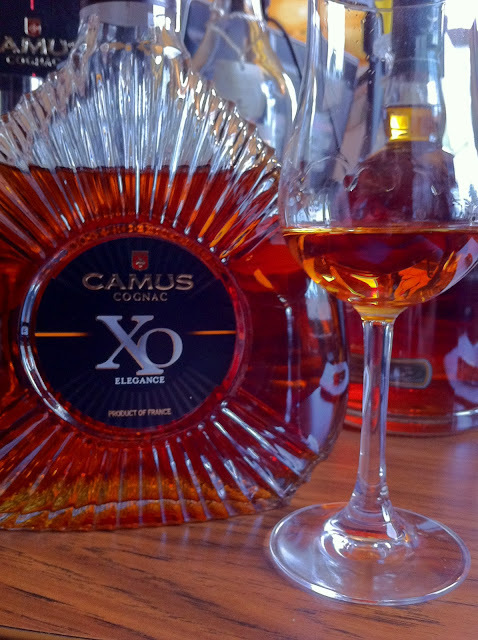 We moved on to Camus XO Borderies, a Cognac made from only from the eau de vie of the Borderies region. Borderies is the best region for making Cognac as the soil is best for growing the Ugni Blanc grapes. Camus uses 100% Ugni Blanc grapes in their Cognacs though only 90% is required. Borderies is the region that the Camus family calls home, owning approximately 80% of the property there. 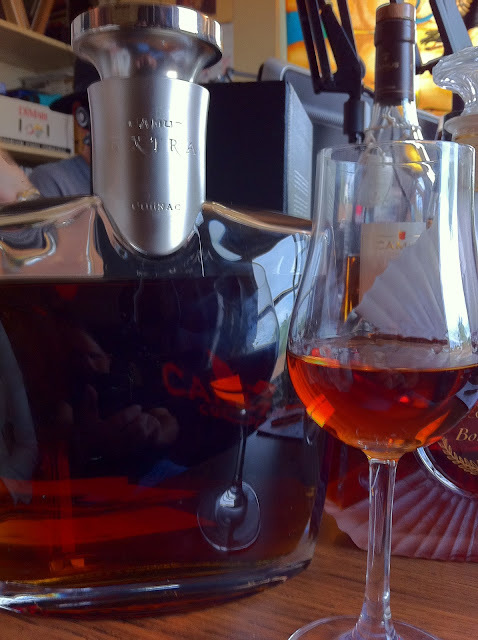 That is one of the reasons they create this unique single-region Cognac, something not done by any other Cognac maker. XO Borderies is aged for an average of 35 years, longer than their other XO. The aroma was perfumey, full of beautiful lilacs and fruit, soft yet beautiful. And the flavors were fabulous. Nice fruit, floral, and a bit of spicy cinnamon. Add some vanilla nuances and I felt like we were baking. The next product we tried, Camus Extra Elegance, was first presented to us in an enormous 1.75 L bottle that was attached to a crane of sorts. That cradle is used to help pour while adding a nice touch to the overall display and presentation.The bottle was spectacular, created by a famous glass artisan, and its design has won numerous awards, even inspiring other famous brands to imitate it, like Bvlgari perfumes. We didn't open the big bottle, which Alex said probably retails around $1200; instead we poured from its smaller 750 mL brother. To be called "Extra", this Cognac has been aged an average of 50 years. Wow. Lots of oak and vanilla and baking scents. Buttery and super smooth flavors. Floral, fruity apricot, a little nutty, spicy. So awesome! My favorite so far. 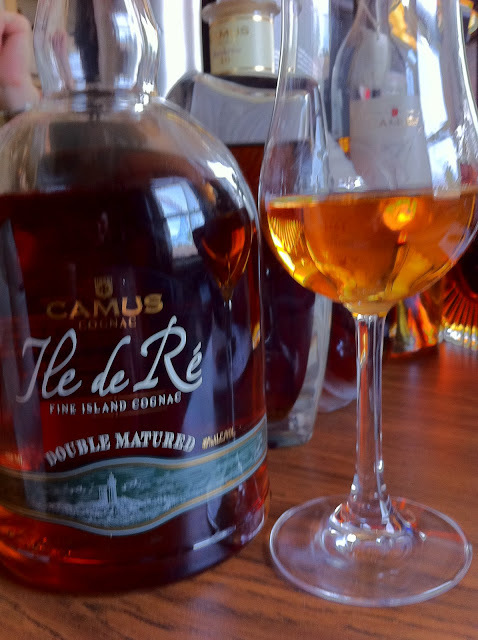 Camus Ile de Ré, named for the island in the Cognac region where it's made, was the next offering. The soil in this region is quite different, so the product too had some uniqueness. 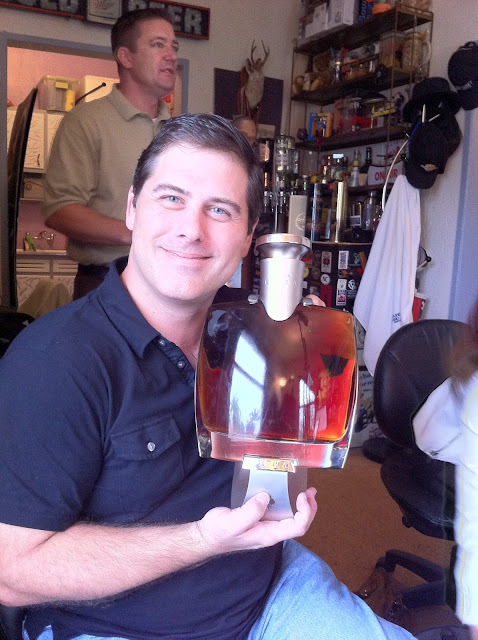 Alex let us know that this Cognac might appeal to Scotch drinkers because of some similarities in the flavors. The aroma was full of vanilla and honey. Orange and other fruity flavors were very nice, but for sure you could taste some salty, smokey, and spicy flavors not present in the other Cognacs we tried. Different and I can see why Camus might be stealing some Scotch drinkers. 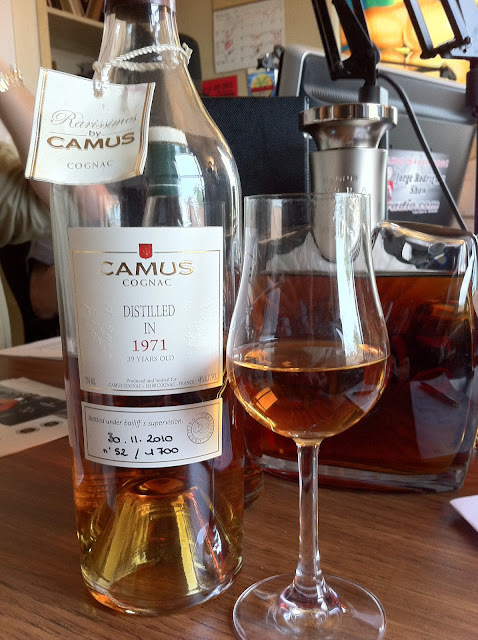 Finally, we got our hands on Camus 1971 Vintage Cognac. I guess Alex was looking at my LinkedIn profile too (considering we already knew her entire resume) to see that was the year I was born. So clever! Smells wonderful, again with the beautiful lilacs. Fruity flavors, more flowers, and really terrific baking flavors. Vanilla, cinnamon, spicy. Alex said that this one might retail at around $700 for the 750 mL bottle, at which point I carefully pushed it back away from the edge of the table. 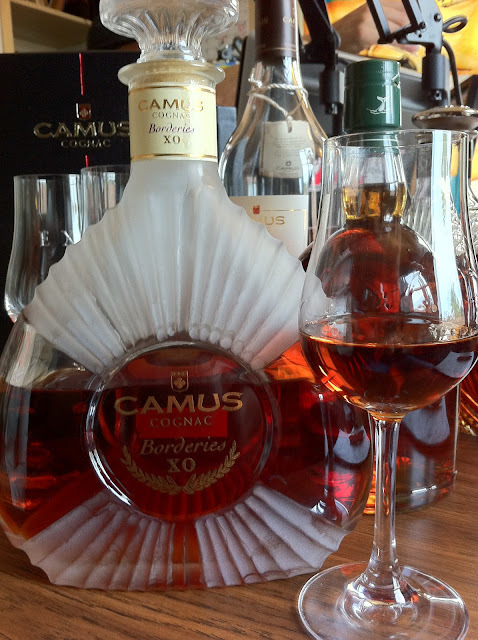 This Cognac was tied as my favorite with Camus Extra Elegance. Alex was extremely sharp and entertaining. We couldn't believe the hour went by as quickly as it did. After the cameras were off, I asked if I could have another pour from the Extra Elegance bottle. Alex said of course, so we all had another. What a happy ending. As I told Ed Roberts after the show (Ed needs to be thanked for arranging to have Alex on the show and of course inviting me), "If I ever get married, I'm gonna date a beautiful woman that works for a top Cognac producer!" He liked the plan. In addition to bringing the awesome products for us to try, Alex also left us with some nice little gifts including a sample of XO Borderies. I think I'm going to need to find an additional job to afford this new potential habit. Is this the product that will make me forget about beer? Brett is calling me to do DailySpiritsReview already. It could happen! So jealous of you and the things you do! Lol, I need to catch up with you somehow. This was an excellent show and tasting. Would repeat every Thursday if I could!